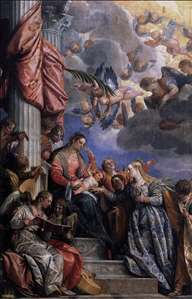 Paolo Veronese was an Italian Renaissance painter; one of the great masters of the Venetian school. 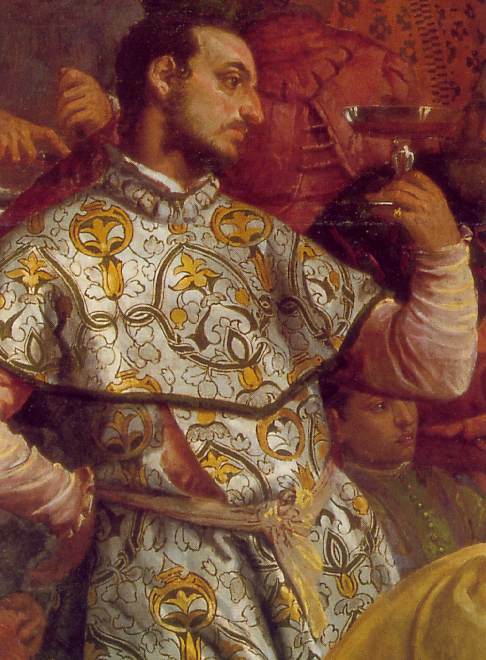 Originally named Paolo Caliari, he was called Veronese from his native city of Verona. He learned painting in Verona from Antonio Badile, a capable exponent of the conservative local tradition. 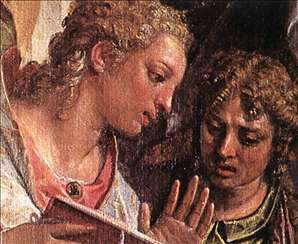 That tradition remained fundamental to Veronese s style throughout his career, even after he moved to Venice in 1553. The painters of Verona between about 1510 and 1540 favoured firm, regular volumes, strong colours that function largely in terms of contrasts, and conventionalised figures. Veronese combined these elements of the local High Renaissance style with Mannerist elements, including complex compositional schemes that often employ a worm s-eye view perspective and Michelangelesque figures in powerful foreshortened or contorted poses. The resulting amalgam was handled with increasing mastery in the Temptation of St. Anthony, done for the Cathedral of Mantua in 1552 (Muse des Beaux-Arts, Caen, France), and ceiling paintings (1553-54) for the Palazzo Ducale, Venice. The first phase of Veronese s artistic maturity, about 1555-65, is well represented by his many canvases for the Church of San Sebastiano in Venice. Their high-keyed interweavings of brilliant, luminous hues are harmonies of contrast in the tradition of Verona rather than Venetian harmonies of tone. The striking compositions often involve multileveled settings and dramatically steep perspectives, especially effective in the ceiling paintings. From this period comes Veronese s fresco decoration (circa 1561) of the Villa Barbaro at Maser, the one such cycle by him to survive. Here he extended the actual architecture of the villa (1555-59) built by Andrea Palladio with painted illusory architecture and populated these illusions with both mythological personages and fictional equivalents of the villa s real inhabitants. 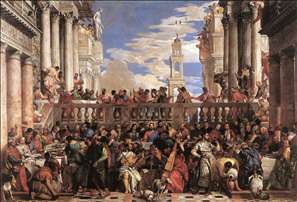 Veronese s growing interest in scenographic architecture, inspired partly by the real architecture of such contemporaries as Palladio and partly by contemporary stage settings, is spectacularly evident in the vast Marriage at Cana (1562-63, Louvre, Paris), virtually a cityscape with incidental figures. 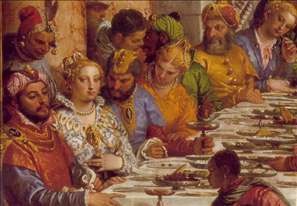 It initiated a series of paintings of biblical feasts, which Veronese represented in terms of opulent Venetian patrician life; actual portraits are included. 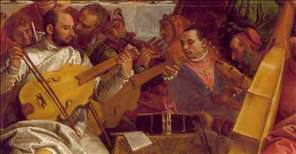 The work of Veronese s full maturity, from about 1565 to 1580, is marked by quieter, more classical compositions, an even greater ceremoniousness of tone, and still more dazzling light and colour harmonies. 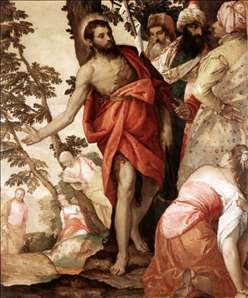 This resplendent style is occasionally modulated into a lowered tonality, as when the artist dealt with subjects such as The Crucifixion (circa 1572, Louvre). Such paintings, in which a new emotional commitment to the subject appears, multiplied toward the end of his career. By about 1583, luminous twilight replaced noonday splendour as the norm, and festivity was replaced by seriousness. The moonlit Pietà ; (circa 1585, Hermitage, Saint Petersburg) is an extreme example. From this period, however, comes the most overwhelming of his ceilings, The Triumph of Venice in the Palazzo Ducale. Here, Venice, personified, floats on clouds halfway up a towering, two-tiered architectural construction thronged with people, all seen from below in steep perspective against a sapphire sky. 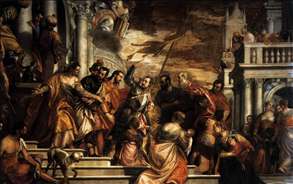 Veronese died in Venice on April 9, 1588. Although highly successful, he had little immediate influence. 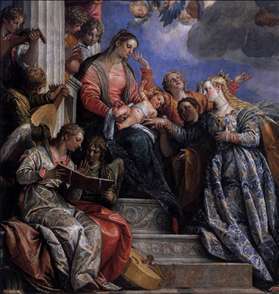 To the Flemish baroque master Peter Paul Rubens and to the 18th-century Venetian painters, especially Giovanni Battista Tiepolo, however, Veronese s handling of colour and perspective supplied an indispensable point of departure. See more details about "St John the Baptist Preaching"
See more details about "Sts Mark and Marcelino Being Led to Martyrdom"
See more details about "The Marriage at Cana "
See more details about "Mystical Marriage of St Catherine"
See more details about "Mystical Marriage of St Catherine "
See more details about "The Marriage of St Catherine "